How much to have a website? It is a very lovely day! The rain had given way to sunny weather. My friend Eily and I were having our regular coffee date, before we needed to get back to our roles as busy mothers. Eily is a book writer. She publishes her books in Amazon. (To see here books, click here.) One way she markets her books, she blogs about them. That day we talked about websites. From my chat with her and my findings about many things in creating my own website, I learned the varying degrees of what people understand about websites, which forms the content of this blog. Today, there so many options of building a website. Often, budget constraint is the factor that most affects the choice; or the right price of the deliverables matches the specification. I had so much difficulty in finalising what tools to use in building one of my own websites, for my specification or design changes along the process. I blame these on the new features I found in my research. They enticed me so much, that I found myself straying away from the design function of my website many times. I have learned so much in doing so, and I had a great time! Anyway, the important lesson I learned from creating my websites so far, is that the more time I spent on the project, the cheaper it could be. Whilst I am learning more on building my website, I am also building more skills to get job done. All I have to do is capitalise on my available time, and in the process spend less money. This might be easy for me, but not the same for everyone. So, here is more information to guide you in your choices and decisions. I hope this blog will help you find the best way of building your website for the best price possible for your budget. I wish you the best. To be clear, we have to start understanding some terminologies. Many already know the meaning of the following words. I thought I knew exactly what these terms were until I discovered that there was more. In order for building websites to be as clear to you, as seeing the constellations against dark skies, here are a few important terms to learn about web publishing. Browser is software that resides in your personal pc, mobile or tablet that you use to access the files from WWW or internet. These are Internet Explorer of Microsoft, Safari Firefox of Mozilla, Chrome of Google and off course there are more. There will be different browsers in your Ipad, Tablet, Android mobile phones or iphone. Website or site is the address where your files are stored, represented by a web address like http://www.FashionYourLifestyle.com, http://Moreish.FashionYourLifestyle.com or http://www.acilegnA.net. A web address is also called link or URL (Uniform Resource Locator) link. Host is a web server where your webpages and its objects are stored. Hosting or Web Hosting is what the service of the host is called. A host must be a powerful computer. Domain name or commonly referred to as domain is the name you bought from a domain supplier for your website, like FashionYourLifestyle.com. This domain name would correspond to a unique combination of numbers in four sets called IP address. There is more to tell about IP numbers which I will not go into further in detail in this post. A domain name is organized from right to left. The first set from the right is what we call TLD (Top Level Domain). A TLD represent a group like .php for Philippines .tv are websites for television programs and .co.uk for United Kingodm. A domain name must be unique combination. Subdomain is the name you add to your domain to define another website, like moreish in Moreish.FashionYourLifestyle.com. I mentioned subdomain, for I find it useful to be able to branch out my domain name through subdomain definitions. In most times, a limited number of subdomains are included when you buy your domain. Blogs are like journals published in the web. I also describe it like a diary that you are comfortable to share with many possible readers. This article is a blog. I never had a diary but I do like writing. Weblog is the pural of blogs or referred to the website of your blogs. Content Management System or Content Management Software (CMS) is what we call the software that are created for the purpose of composing, editing, amending documents or files to publish in the web. Good examples are: WordPress and Blogger for creating blogs, Facebook, Instagram, Google+, Linkedin for publishing little notes to quickly keeping in-touch with people, Twitter is like broadcast text, Youtube for video, Weebly, WIX, Joomla, Drupal as web builders and many more. Web Builder or Website Builder are Web CMS or WCMS are for creating web pages of a website. Examples are Weebly, WIX, Moonfruit and Google sites. Search Engine Optimization (SEO), is an algorithmic program in a web software that increases traffic going to your website. If you want your website to attract a high level of traffic from the internet then you might want this service. Different providers have different ways of offering this service. I remember Bluehost.com includes this with their lowest package available whilst GoDaddy does not. As I was saying before, the more time you put into creating your website, the lower it will cost you to get it done. So planning the design will create the website smoothly and much quicker. Here are some questions to help you draw a clear design of your webpages. If you want your website for your own online shop, it is best to have your domain name. In my observation, adding a shopping cart is easy if you pay for the monthly plan which has the highest price. Although you can add shopping carts by yourself for no cost. To reach more buyers, you should think of including SEO in the package. I remember a very good web hosting provider Bluehost.com includes this in their lowest package available while GoDaddy do not. There is more to know in setting up an online shop. It is best to write down questions and ask the experts or support. Bluehost.com and GoDaddy do have sales support to chat or a hotline number to call. There are many CMS that provides blogging functions like WordPress and Blogger (by google). You can start this for free and upgrade your plan as you require. You can do this yourself or again use a WCMS to build your website. Read examples later in this blog. If you want a dynamic website that is easy to change, there are now WCMS that do not require you to know any programming. You can start on the free plan and upgrade your package as you require. The only disadvantage of these WCMS, is that you will not have a copy of the webpages. If you want to change WCMS provider, this won't be easy and maybe not possible. Draw the webpages of your website. I believe this task is a must; and must come from you. On a big piece of blank of paper, draw the home (first) webpage. Then the following pages, each on separate pages. Put as much details as you can. If you have an idea of your logo, draw it. These drawings will be your guide. If not yours, then it will be up to the person who is going to build your website. A clear design will definitely save your money. Do you want to have a choice of domain name for your website? If you want to have a chosen domain for your website, you need to have an annual budget for it. A purchase of a domain name may come with limited number subdomain that has "forwarding capability" which I think you will find handy in the future. If you are still choosing your domain name, choose something that sounds catchy. There are many providers of domain names. I bought my first domain name from GoDaddy.com. I have been their customer since 2003. It has been around for as long as I can remember. GoDaddy.com started from selling domain names and progressed to selling other related services like web hosting, web building with products and services to expand your business by adding e-commerce and many more. I suggest you look around and see what providers include when selling domain names. If prices are not too far from the other, consider the reliability of the provider based on the feedback of previous buyers. Support for me is very important. Would you like your website to be accessible by mobiles? Although I am not a fan of reading from a tiny screen; I cannot deny the fact that many people like this. In my point of view the application of technology as it is now and where it will be in the coming years, is all about getting everything available in a pocket size gadget (mobile phone). If only we can ride on our mobiles, we would. But actually, in a sense we are able to go to places using our mobiles: by calling, text messaging (SMS), sending emails, receiving and sending broadcast through social media (like Twitter, Facebook, Instagram), daily news, searching for a place using maps, listen to music, watch a video, browse the web or get your daily blog update. There are a few WCMS that flags its capability to display your website in mobile web. Just be aware, availing this might incur extra cost monthly. As I composed this, I remembered Yaro of http://www.entrepreneurs-journey.com, I started following his blogs by reading it whenever I have the chance. But later reading is not possible: because I get dizzy when in the car, or lost my thoughts when interrupted. One day, I am so interested about his topics, that I downloaded his podcast in my mobile when connected via wifi at home. Just one example of a website still accessible via mobile web in a different way. Do you want to be able to back-up your files? Once you build your website; created those web pages or composed your blogs; you want to make sure, that it won't just disappear. You do want a backup or copy of it. If not, you would like to make sure your provider will back it up or guarantee in the contract that they could restore it. For people who will build their website themselves, read the contracts carefully and find out how to back up your work before you do more further development on your website. Would you like identified people to access your website so they can modify designated webpages? Sometimes, you would like to have a part of your website dynamic, in the sense some people could modify or edit it. Some WCMS like Weebly has the capacity to setup some part of your website accessible to identified users by passwords. This feature might incur additional costs in the package. How much you could spend to set it up? You might want to pay someone to create your logo or customize pictures. Thinking about these things will not hurt the budget. If you have an annual budget, how much would it be? If you want to have your chosen domain name for your website, this will cost you an annual charge. Other services that you might want to include is the service for "privacy, which will hide the owner of the domain when "who is" is invoked. If you would have a monthly budget, how much would it be? It is important to have an idea of how much you are happy to spend monthly to have your website up an running. To further understand the available tools to create your website, here are some links that demonstrate and example of a WCMS. This link here, is a demonstration on how you can build your website using Weebly. WIX would be similar to Weebly. Click here to view their short demo. Have you noticed operation is mostly done by drag and drop mouse manipulation? If you can learn programming, and you would like to build your website at a very low cost, this is possible. Here are some examples of how to do it. These are all my experiences in building my weblogs and website. FashionYourLifestyle.com and DIYTechTips.acilegna.net are my weblogs in blogger.com. I purchased these domain names from GoDaddy.com. Each cost me a very affordable annual fee. I use the subdomain manager to create DIYTechTips as a subdomain of acilegna.net. I use domain forwarding to forward any request for FashionYourLifestyle.com to my weblog in blogger. This is also the same with DIYTechTips.acilegna.net. CinderellasMarket.com is my website at google sites. Again, I purchase the domain name from GoDaddy.com. Although google sites is not as smooth to use like Weebly or WIX, its functions is enough for what I need and the price is right. In google sites, you can have a webpage for your blog, for a list, file cabinet or webpage. To have more control on how to format the webpage, it is best one knows HTML programming. acilegnA.net is my profile website. I created this by scripting it into HTML. The body is created using Microsoft Word and saving my file to web filtered HTML format. This is hosted at GoDaddy.com. One thing to consider in buying any web hosting services is the reliability of support. There are two providers I would say are reliable: GoDaddy.com and BlueHost.com. For so many years, I have been a customer of GoDaddy.com on acquiring domain names. There was time time I bought web hosting services from Bluehost.com. Bluehost.com support are very professional and fast in their reply. They have always delivered a superb service in answering my questions. They have always given me a direct answers to the points raised. GoDaddy.com support is also very good. What I don't like is their website: which confuses me as to what is included in the package. But they are very nice in answering my questions during request for support. To further assist, I hope you will find this table useful to note down your cost before you spend. There are labels for others or blanks left, for you to fill it up. My blog is almost the end. I do suggest you watch the demo and log the price for the plan you like as a guide. I only mentioned a few providers in this blog. This is because I only want to demonstrate what and how you could build your website. There are other bloggers who survey and write about what they think are the best WCMS. There is no harm in reading their blogs and discover more providers so you can have more choices. You can search for "website builder". Or, if at the end of reading this, you found that you just like to display information about yourself to connect with family and friends; maybe you just need a WCMS to publish your profile like Google+, Facebook, Instagram, Tumblr, Linkedin, Youtube, Myspace and many others; which definitely are all free as long as we abide their contracts. Through the process of building my website, I also created logo and background image for the heading of CinderellasMarket.com. I discovered products that almost match the capabilities of the well known Adobe Photoshop at the right price. The next objective of web publishers is to earn money from the article that is published. Why not? I am sold on that idea and I know it is possible. I have converted some training DVDs to format that I can play in my tablet. I discovered what software converts to good quality output, plus have dynamic editing capability. I hope I have delivered another useful blog if you are keen on any of these topics, you might want to subscribe to my blog. Thank you for reading. Until next time. If you are interested to avail services from the providers I mention above, here are links with discount to their websites. Fix blocked ink problem on Epson PX710W – A DIY job or pay someone to do it? FIY is not everyone’s cup of tea. But at this modern time, availing the gadget the technology has to offer comes with a price which is bigger than what we expect when things break. To save, FIY is a better choice if we find time, rather working hard to earn the money to pay someone to fix our problem. It could not break the bank if we do cautiously by investing time on research. True, along the FIY process, sometimes it is hard to see the end or let say: “the light at the end of the tunnel”. All I could advise is be patient. Everything has an end. It is hard for me to say that it will be what you want, but one thing for sure, there is always learning during the process of FIY. Before embarking on a FIY project, research, evaluation is a must. Here are some tips or guides I come up that could be useful for someone who is confuse on what option to choose. 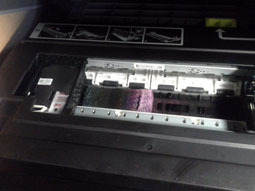 To show you are real application, I would to use my experience in solving “the blocked ink problem on Epson PX710W. If the project is like fixing a printer (like my project) and the object is still in warranty, avail the warranty. Even the problem cannot be fixed, at least you will a chance to know and ask questions to know the details. Ask the estimated cost to fix the problem. Then you can go back in front of your computer to do more research for options. My printer’s warranty expired. From the web, services are not available in the area. I have to travel 10 to 15 miles to avail support from Epson dealers. It could cost me £200 for the initial service, which I am not sure if that guarantees to fix the problem. As yourself, do you still need the services of this item now and in the future? If your answer is yes, then continue reading the guides. Pay someone to fix it. If you do, how much would it cost to fix the problem? DIY. You might be asking how much time would it take you to fix the problem. How much would cost you? I cannot exactly tell how much time you need to spend and how much you need to spend on consumables. But my experience is here to make it easy for you. Epson PX710W is a good scanner and printer. It also can print CD labels. It has built in feature to print A4 pads with lines, or outline for coloring. It could also accept 200gsm thick paper. All this I discovered when it is getting difficult to find support. It has a built in “head cleaning program” which does not work but only consumes ink if there is a nasty blockage which is the problem my PX710W has. We bought it around for the price of £300.00 four years ago. Its equivalent would be roughly the same price, for I want the same feature to assist my child in his homework. Any printer is prone to the same problem: ink blockage. If I do not understand how to deal with it now, I still need to know how to resolve it in the future. I just postponed the problem and maybe cost me more for not dealing with it now. If I choose to pay someone to solve my problem, I cannot tell the exact cost to fix the problem. However I estimate it can cost me about £200 for initial service. I know that I will have the same problem again. To replace it will cost me at least £300. The initial cost for an Epson printer support to fix it more likely to cost me at least £200 (this does not include the consumables which is the ink). I decide to try the DIY in a very cautious fashion to guarantee my success. Here are the problems I encountered with solutions and my advice. Ink pads near end of life. With this warning message, you are just about to have the problem. All ink that did not go on the paper during printing has to go somewhere. The waste pad absorbs it. Most ink jet printer now use counters to detect the end of life of ink waste pads. You have to decide whether to replace the waste ink pad or buy a waste ink potty. Disable the counter that triggers the warning message. If this reaches the limit, it may not allow printing. A software fox PX710W is available for download to reset the counter, but you need to buy the “WICReset code”. For those who go for the ink potty you could buy this from the dealers available. It is hard to find waste pads. But I did find one for Epson PX710W and it is more expensive than the printer potty. I think ink waste ink pads, require more work to install. You have to cut the pads into shape. Either is difficult to install. You have to remove the sharp metal plate at the bottom of the printer. Be careful! It could slice your skin deeply. The advantage of the printer potty, I only have to open the bottom of the printer once and hopefully never again. If it is the waste ink pad, this needs replacement sometime in the future with a new one. I suggest if you have removed the metal plate, do not put it back. To install the printer potty, you need to put a hole to bring out the tube that spits the wasted ink. Pattern still print skips off course. Printer ink heads still clogged. Soak the ink heads for three days. Do a print of the nozzle check. If there are skips, perform the printer’s head cleaning not more than three times. If there are skips, soak the ink head again using the recommendation above. For more information on how to soak the heads of Epson PX710W, continue reading below. How to soak the printer ink heads of Epson PX710W? You have to fold the wipes (I used two wipes) into a width that is enough to soak the ink heads. This has to be place under the ink heads. But because the ink heads are permanent, the wipes has to be inserted through. Few pictures are provided to understand how to do this. 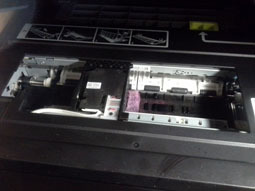 Ink heads of PX710W is locked into station when not printing. To unlock it, turn off the printer. But as the printer working its way to be turned off, listened to it and when you hear a sound as if it is printing, quickly turned off the printer from the main. Unplug the cord if you have to. To make sure you don’t break the printer, keep it unplug or turned off the main. Open the printer and try moving the ink head, it is possible to lift this a little. Place the tissue. Use the syringe to wet this from time to time. The tissue has to be very wet but not releasing the water. Then try moving the ink head on top of it. Do this once a day. After three days, remove the wipes. Turn the printer on. Perform a nozzle check. Printer might display an error. If this happens, turn off the “Auto Cleaning Adjustment” under Maintenance. You might need to do this very quickly before an error displays and prevent you for doing this. If there are skips after performing a nozzle check, perform the head cleaning adjustment not more than three times. When I encountered this blockage problem, I just started using a new set of compatible cartridges that cost 1/3 of the price of the original brand. Off course I suspect this caused the problem. In my research, it has been highly recommended to go back and use the original cartridges for the printer. But a branded cartridge could cost almost £10. It could be cheaper like £48 for 6 cartridges when on sale in online shops. The more it become my concern of buy the expensive brand after reading this article from guardian: http://www.guardian.co.uk/money/2013/feb/23/printer-ink-cartridges-paying-more-getting-less. During my troubleshooting of the ink blockage problem, I know I will run out of ink before I can the printer work. So I started looking around for a cheaper way of acquiring good quality inks. In my looking around, I came across the CISS system. I also came across http://www.talkphotography.co.uk in good time for it made it easy for me where to get a CISS system. Its members recommend http://www.cityinkexpress.co.uk/ciss/epson/px710w/px-series as the best CISS supplier in UK. If you are from U.S., http://www.Marrutt.com is a well trusted supplier. There are two types of ink: dye and pigment. In my simplest way to explain dye is made of liquid solvent that dry more easily while pigments are made from crystalline structure. http://www.macworld.com/article/1054216/inktype.html has more to tell. In cityinkexpress, they have dye, pigment and Lyon ink – the most expensive. Lyson is also a dye type of ink. Although it is the most expensive, the recommend, using the Lyson CISS it will only cost 1.28 per cartridge. So the cost of twelve cartridges is about the same price of a Lyson CISS. I thought it is worth a gamble. So I bought the Lyson CISS and installed it successfully. I am very happy with this decision for indeed print far better using the Lyson ink. It has been a long weary process to resolve the ink blockage problem of my Epson PX710W, an expensive good multifunction printer. Due to cost and uncertainty in achieving the result – that is getting the printer fix, I chose the DIY option to fix the problem and learn through the process to save money now and in the future. I am sure that I am not buying waste ink pads in the future and my cartridge cost is now down to £1.28 per cartridge and still able to print lovely pictures. My success happened because of the posted information I found using google. To the authors or writers, thank you very much. Here are other website that I found it helpful. http://www.octoink.co.uk/products/Replacement-Waste-Ink-Tray-%5BPX700W%7B47%7DPX710W%5D.html – waste ink pad. I find OctoInkjet is a good supplier and polite. http://www.octoink.co.uk/kb/questions/108/Epson+PX700+-+PX730WD – has instructions on how to install the ink potty. http://www.youtube.com/watch?v=uxNJ0UjnpPU – how to install a CISS system. CityExpress also has their own video. http://www.epsonreset.com/models.shtml- the site where you download WICReset, the software you need to reset the counter of Epson inkjet printer. http://www.giantprint.com.au/glossary - useful glossary of terms with regards to printing.